Is a Connecticut rose garden wedding your style? Imagine your wedding photos in a rose garden gazebo! From the world-renowned Elizabeth Park Rose Garden near Connecticut's state capitol to Mohegan Park Rose Garden in the city known as "The Rose of New England" to the Pardee Rose Garden in New Haven, your rose garden wedding will be the highlight of your guests' summer. Elizabeth Park is on the border of Hartford, Connecticut and West Hartford, Connecticut. Weddings in Elizabeth Park can take place in the gazebo, in the pergola, by one of the ponds, or in one of the gardens. When the roses are in bloom, there is no more picturesque spot! Parking is free and there is no admission charge. Other gardens in the park also provide a beautiful background. The Pond House, near the north end of Elizabeth Park, is picture perfect for your reception. Please see my Elizabeth Park Weddings Page for more information. The Mohegan Park Rose Garden in Norwich, CT is perfect for an intimate wedding. 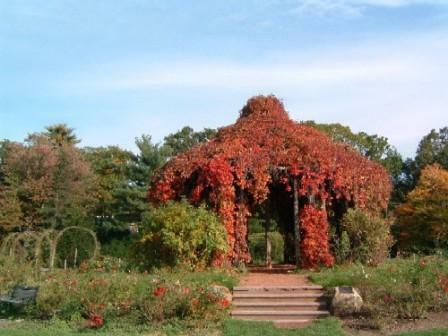 The Mohegan Park Rose Garden in Norwich, CT is perfect for an intimate outdoor wedding. The gazebo on the North side of the garden is convenient for weddings. For a small group of people, having everyone inside for a gazebo wedding might be ideal. For a larger group of guests, having your wedding ceremony by the sundial just outside the gazebo and having your guests watch from the garden might be a better solution. There is plenty of room for a large wedding party plus lots of space for friends. Parking is limited to the streets. Carpooling is strongly urged. 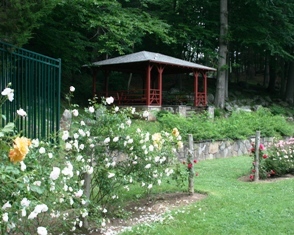 The Mohegan Park Rose Garden is a small part of the much larger Mohegan Park, which you can see on my Mohegan Park Page. Both are just a few minutes from the Mohegan Sun Casino and less than a half-hour from the Foxwoods Casino. The Pardee Rose Garden is in East Rock Park, New Haven, Connecticut, very near the Hamden, Connecticut line. The gazebo in the Pardee Rose Garden looks like the top of a wedding cake, with the brick tiers that also hold roses and other flowers representing the cake. Imagine yourselves being the couple atop this living wedding cake! This photograph was taken early in the rose season. Later in the year the roses and other flowers are at their peak. There is plenty of room for your guests in the garden surrounding the rose-covered gazebo. The Pardee Rose Garden holds many other kinds of beautiful flowers in addition to roses. The address for the Pardee Rose Garden is 180 Park Road, Hamden, CT 06514. You can reach the Park Greenhouse at (203)946-8142. Copyright © 2012 Ernest Adams — All rights reserved.